UPDATE: The dude is fast for a 12 yr. old who hasn't quite sprouted the long runner legs yet. 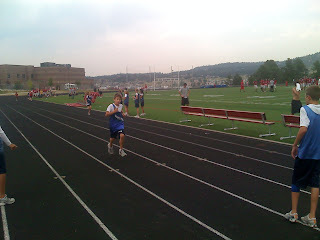 He ran a 8:07 pace in yesterday's meet at Castle Rock Middle School. This afternoon was his first ever cross country meet. The temps were again in the 90's. The course was a boring, hilly, hot, dry and windy course. Jesse finished with a 9:04 pace and got the gatorade and water treatment from Dad and Stepdad Mark. I changed my mind...I think I have redefined running Nirvana. A father's pride.